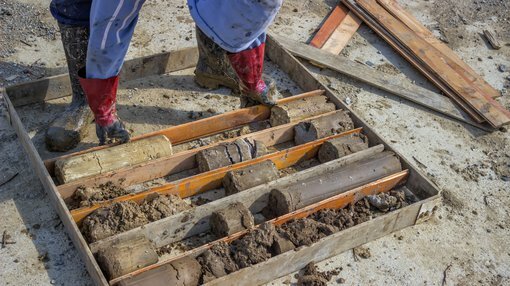 Australian Mines (ASX:AUZ | OTCQB:AMSLF | FWB:MJH) this morning announced that surface geochemical sampling over Target Area A at its Thackaringa Project in NSW has identified three zones of elevated levels of cobalt. The cobalt content of these anomalous zones is reportedly similar to that observed at surface over Cobalt Blue’s (ASX:COB) Pyrite Hill and Big Hill cobalt deposits. 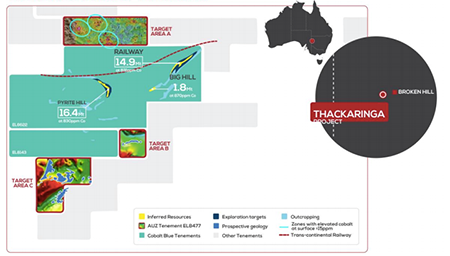 Importantly, the elevated cobalt results within one of AUZ’s anomalous areas appear to be coincident with the geophysical response observed in its electromagnetic (AEM) survey over the Thackaringa tenement package at the end of 2017, and confirmed by a follow-up high-resolution Fixed Loop Electromagnetic (FLEM) survey completed in March this year. With the anomalous zones being in part buried by a shallow alluvial cover, surface expressions of cobalt mineralisation of more than 15ppm are considered significant. This technique has been successfully used by Alloy Resources (ASX:AYR) on its Ophara Cobalt Gold Project, which sits directly to the west of AUZ’s Thackaringa Project. It is also the documented geochemical signature of the Pyrite Hill and Big Hill cobalt deposits. AUZ is continuing its soil and surface sampling program at Thackaringa — this program is designed to evaluate the entire tenement package. AUZ said it anticipates making further announcements on the results from its geochemical sampling program throughout the coming quarter. Yet AUZ remains a speculative stock and investors and investors should take a cautious approach to any investment decision made with regard to this stock. On completion of the geochemical exploration program, the new areas of elevated cobalt will be the subject of AUZ’s maiden drilling program at Thackaringa, which will also include the testing of the recently-identified bedrock conductor, BR_02_CC. In parallel with this, AUZ has continued to advance its flagship Sconi Cobalt-Nickel-Scandium Project in northern Queensland, making pleasing progress toward major development milestones in the months to come. Critically, Sconi is the only cobalt project in Australia with an 100% off-take agreement already secured for production. AUZ’s landmark agreement with Korean-headquartered industrial conglomerate, SK Innovation, is for an initial seven-year period, allowing for a six-year extension. SK Innovation will purchase Sconi’s nickel and cobalt production at volumes of 12,000 tonnes per annum of cobalt sulphate and 60,000 tonnes per annum of nickel sulphate. SK Innovation has been highly engaged and supportive of AUZ’s project development timelines, which are being considered as part of the Bankable Feasibility Study (BFS) optimisation process. Senior representatives from SK Innovation, along with its banking / finances partners, have travelled to both the Sconi project site in Queensland and the demonstration-size processing plant in WA as part of the production optimisation process. This ongoing dialogue is enabling AUZ to further fine-tune the project’s economics ahead of the construction of a full-scale processing plant onsite at Sconi, scheduled to kick off from the end of the year. Since the demonstration-size processing plant in Perth was commissioned in March this year, AUZ has successfully refined the plant’s design, which has resulted in significant improvements in both the recovery rates of the cobalt, nickel and scandium from the ore, as well reducing the residence time of the ore within the circuit. The demonstration-size plant uses a replica processing flow-sheet that is being considered for the full-scale operation to be built at the Sconi project site. This continuous processing test work will be also utilised to process future ore samples from the highly analogous mineralisation identified at the Flemington Project in NSW. Further to that, AUZ is also utilising the plant to demonstrate its ability to produce high-purity scandium oxide from Sconi (initially). Given that this is not committed in the SK Innovation off-take agreement or contemplated in the economic modelling being completed as part of the BFS, any off-take agreement for scandium will provide considerable upside to revenue and shareholder value. AUZ is actively engaged with a range of potential off-take partners for scandium, and will continue to provide samples to these parties during the course of this year. Furthermore, project finance negotiations continue to accelerate as international banking and financial institutions position to fund Sconi. SK Innovations has made continuous statements to foreign media, highlighting that AUZ will be the sole provider of cobalt to its battery plants around the world — including its Hungarian battery plant, which is contracted to supply electric vehicle batteries to a number of premium German automotive companies from 2021. This has intensified interest from the banking sector, crystallising the important role AUZ plays within SK Innovations’ rapidly expanding global battery business. Announcement of these updates this morning has put AUZ in an ascendant position, with its share price currently up 6.10 per cent, currently at 8.7 cents.